Jazz a scalable, extensible, team-collaboration platform that integrates tasks across the software lifecycle. The platform also provides useful building blocks and frameworks that facilitate the development of new products and tools. For your software lifecycle: Use Rational Team Concert, Rational Quality Manager,	Rational DOORS Next Generation, and Rational Software Architect. For systems engineering and embedded software: Use Rational Team Concert, Rational Quality Manager, Rational DOORS Next Generation, and Rational Rhapsody. See New & Noteworthy in the Downloads section for the latest on new features and enhancements. Each Jazz Team Server provides the foundational services which enable a group of tools to work together as a single logical server, and includes any number of Jazz Team Server Extensions that provide the tool-specific functionality. A Jazz Team Server Extension is tool-specific functionality which is affiliated with a particular Jazz Team Server instance. 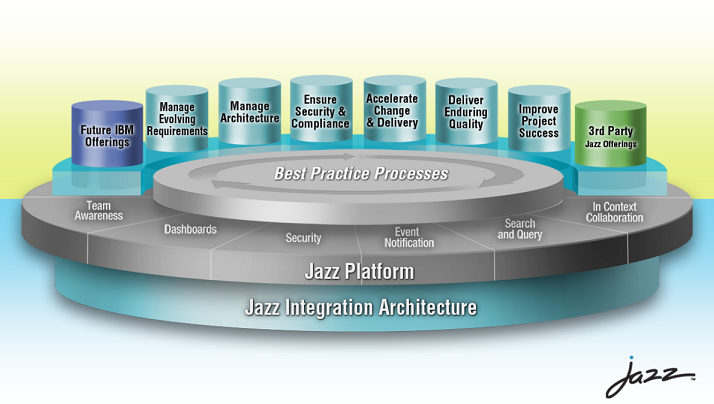 Each tool uses certain facilities provided via Jazz Foundation Services in order to interact within the Jazz Team Server, and exposes its own services and data through RESTful Web services.